This is a super easy and beautiful dish to entertain with. Since Super Bowl is tomorrow this would be most perfect! 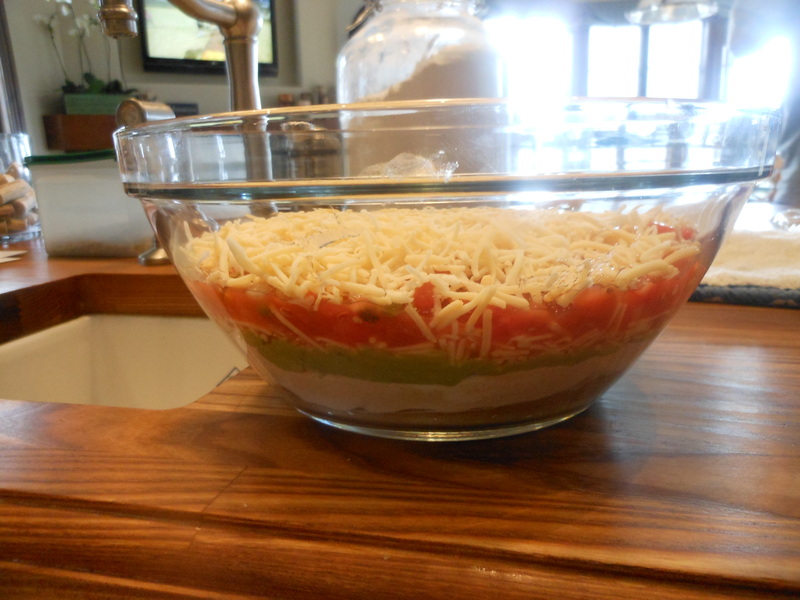 It’s great in a glass bowl where you can see all of the layers. I prefer to make this without meat but if you would like make one of the layers ground beef or ground turkey. Just drain the meat before adding and make sure that the meat has cooled before adding all the other ingredients. Feel free to play around with ingredients, whatever works for you. This recipe is best served at room temperature, I’ll usually make it earlier in the day and take it out of refrigerator an hour or so before serving. Another thing I would suggest is to go to a local Mexican restaurant that you like and buy your refried beans, guacamole and salsa there. It’s usually the best. Sometimes I will make my own guacamole etc. If you’d like to you can double down on all the ingredients. This will probably serve 12 as an appetizer. Sadly, my pictures won’t be posted till tomorrow because I won’t be making it till then. It’s just such a fun , good recipe that I wanted to get it out to you. *if adding meat use app. 1 – 1 1/2 lbs. ground beef or turkey and make sure it is drained and cooled down before adding it to dip. *if using meat just heat up a little bit of olive oil in pan and cook meat and drain meat after cooking. You’ll want to cool meat down completely before adding to dip. Cover with plastic wrap, refrigerate and remove about an hour before serving. Serve with chips for dipping and have a spoon handy to help serve it. This is a super easy and beautiful dish to entertain with. It’s great in a glass bowl where you can see all of the layers. I prefer to make this without meat but if you would like make one of the layers ground beef or ground turkey. Just drain the meat before adding and make sure that the meat has cooled before adding all the other ingredients. Feel free to play around with ingredients, whatever works for you. This recipe is best served at room temperature, I’ll usually make it earlier in the day and take it out of refrigerator an hour or so before serving. Another thing I would suggest is to go to a local Mexican restaurant that you like and buy your refried beans, guacamole and salsa there. It’s usually the best. 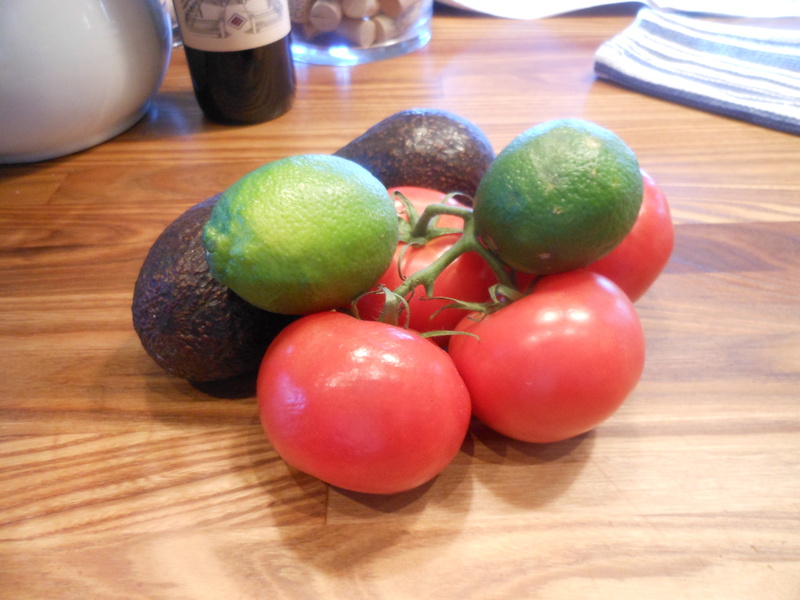 Sometimes I will make my own guacamole etc. If you’d like to you can double down on all the ingredients. This will probably serve 12 as an appetizer. This is a super easy and beautiful dish to entertain with. It’s great in a glass bowl where you can see all of the layers. I prefer to make this without meat but if you would like make one of the layers ground beef or ground turkey. Just drain the meat before adding and make sure that the meat has cooled before adding all the other ingredients. Feel free to play around with ingredients, whatever works for you. This recipe is best served at room temperature, I’ll usually make it earlier in the day and take it out of refrigerator an hour or so before serving. Another thing I would suggest is to go to a local Mexican restaurant that you like and buy your refried beans, guacamole and salsa there. It’s usually the best. Sometimes I will make my own guacamole etc. If you’d like to you can double down on all the ingredients. This will probably serve 12 as an appetizer..